The dream of wine and cigar enthusiasts. Jewel of your home and office. 100-800 Cigars, 48 bottles of Wine and Champagne stored in the ultimate condition, in super silence. 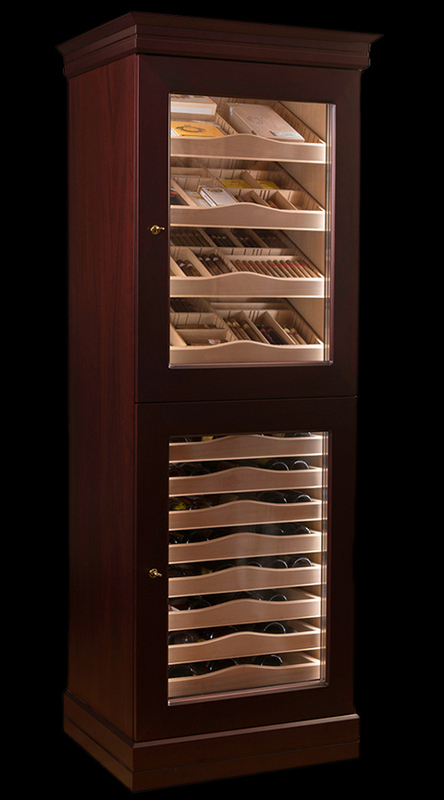 Maklary wine and cigar humidor cabinets are entirely made of valuable solid wood, and represent a wide range of the most modern technologies. Its size: 205x70x60 cm; its weight of 150 kg and its appearance are commanding. It is available in a wide range of wood type materials, with the desired lacquering, in any unique color. Top quality in all respects without comprises. Timeless elegance, classic and modern at the same time. The curved fronts providing special light effect and the specially milled trays also are Maklary trademarks and form integral parts of the design. Maklary humidors are exclusively made of top quality solid wood materials. Neither plywood nor veneer is used. We create top quality and lasting value works from the most valuable natural wood materials. The form of door, color of glass, footing and crown are individually customizable. 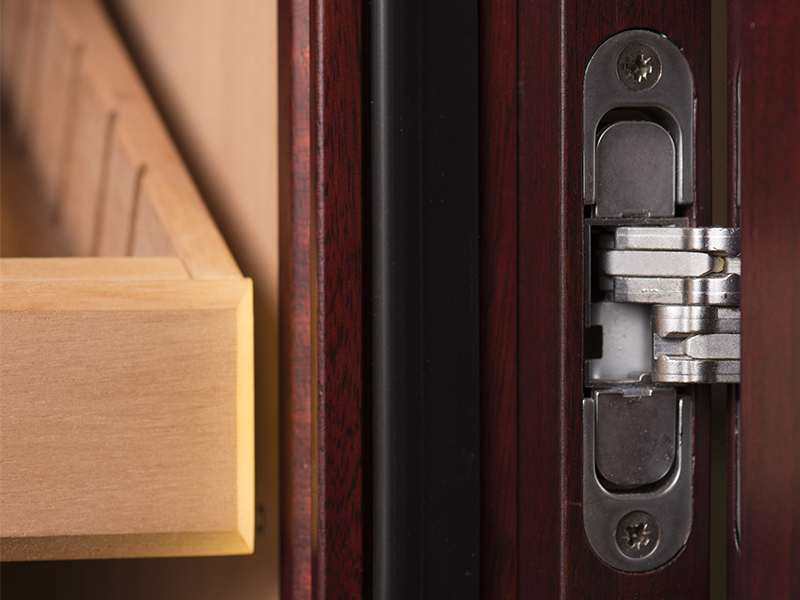 We make cabinets from any type of solid wood with the required solidity on demand, whilst the interior lining and trays are made of Spanish cedar. We offer matt, semi-gloss and high-gloss lacquering, or any specific color. Our craftsmen manufacture crest etchings and specific carvings on demand. Maklary humidors are made for a lifetime. 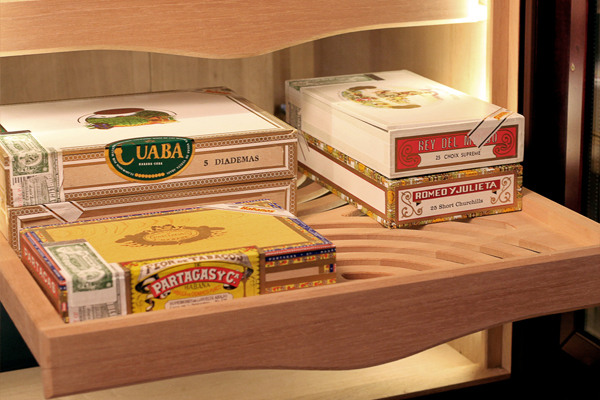 In order to avoid twisting and warping, humidor cabinets are held by a massive frame structure. It is positioned between the exterior solid wood and the interior Spanish cedar lining, thus the frame is completely invisible. 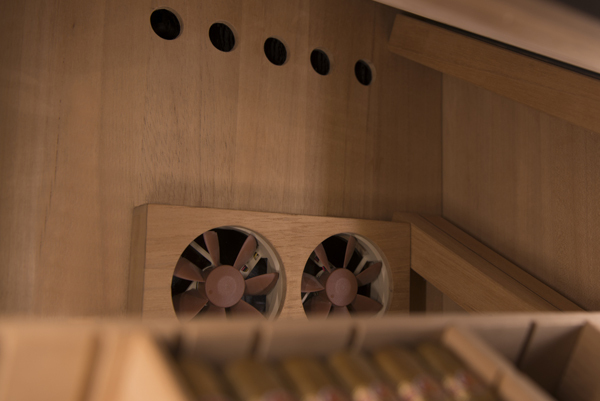 The electronics responsible for the central control of all functions is positioned in the Spanish cedar case, recessed into the sidewall. German display, Swiss precision capacitive sensor, American processor. We use only the most suitable parts for each function. 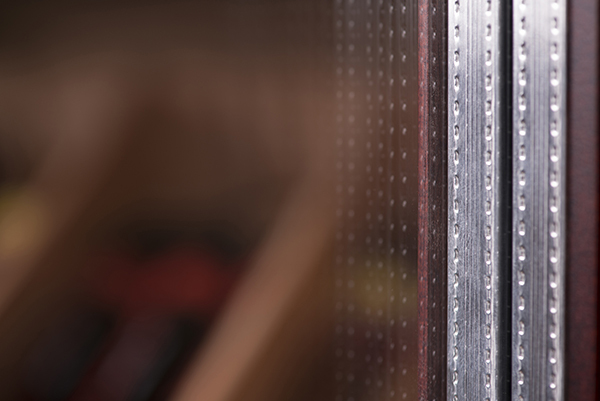 The interior part of the cabinet is equipped with hidden led lines running vertically on both sides. Our conscious engineering in lighting technology ensures the impressive appearance provided by a Maklary humidor cabinet in the dark. The full electronics is modularly interchangeable to ensure immediate serviceability. On-site repair does not require a professional, replacement of modules can be performed by almost anyone. A powerful MCT L humidifying machine – specifically developed for this model – is responsible for the steady humid air, blowing through a precisely constructed air duct to each tray, on all levels. Each tray is milled of 8 mm solid Spanish cedar tables using a unique, special milling pattern. The pattern is functional and aesthetic at the same time, thus the largest part possible of each cigar’s surface is exposed to humid air. All trays can be pulled out and slide on special hidden rails. Interior layout is freely variable. The tray is our trademark. Compartments follow different cigar sizes: 132 mm for the shortest ones: robusto, corona etc., 160 mm for types like piramide, corona grande, 180 mm for lonsdale, churchill, lanceros and double corona cigars, whilst 250 mm for special sized ones. Each tray serves for storing 100-150 cigars. Designed for storing 8-10 cigar boxes. 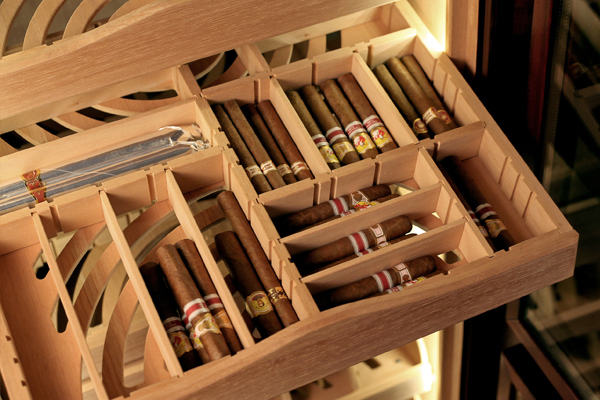 Storing cigars requires not only constant humidity of 70 %, but also a constant temperature of around 20 °C. If the room is air-conditioned, and the temperature is almost constant throughout the year, then thermal insulation, cooling, heating and related extra convection are not necessary. In case of uneven temperature, the following Maklary technologies provide perfect solutions. 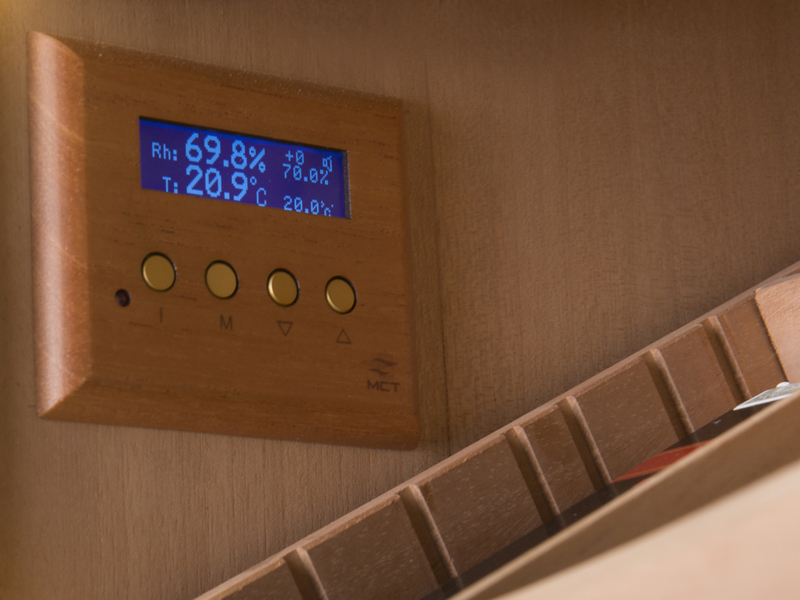 The highly efficient integrated convection solution also represents a Maklary innovation: the fans draw in and mix the air in a hidden air channel on the left side of the humidor cabinet on each level, then blow it back steadily on the right side on each level. As a part of convection, further extra function is available: 2 germicidal UVC lamps turn on during the operation of fans in the air channel, thus destroying all existing organisms in the air, like mold spores and bacteria. Special Maklary technology. 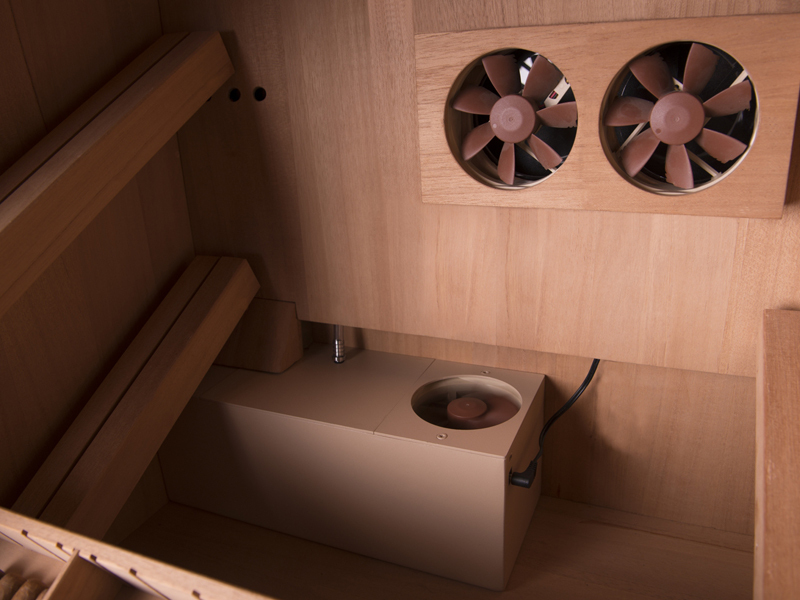 The custom-made heater is placed in its own air channel which is hidden under the backside cedar lining. Due to the specially designed air channel, the fans can disperse warm air evenly in the internal space. The dual-chambered, triple-glazed glass and the top quality thermal insulation – of 4 cm thickness, positioned between the exterior and the cedar lining – make a real refrigerator of the exclusive solid wood cabinet. This special cooling solution is also a unique Maklary technology. Constant temperature is maintained by the special, doubled surface cooling panel in the air channel developed for the cooling of a humidor. The fans perform steady cool air blowing on multiple levels. Top quality German inverter compressor, which also provides powerful performance at base speed, thus operating silently, due to the appropriate sizing. The compressor – already operating silently – can be placed in a soundproof box due to the precise engineering, resulting in the absorption of further 70 % of its noise. Operation at higher speed is also optional, which ensures extreme cooling performance. The specific suspension of the compressor guarantees 100 % vibration damping. 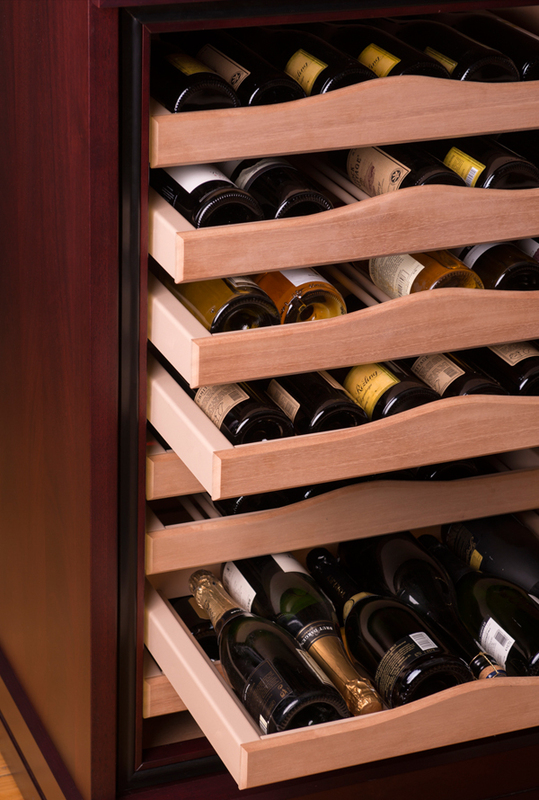 It is the same as the wine tray in all aspects, but its configuration was designed for storing 6 champagne bottles of any form.